More importantly, you need your vet’s number so he/she can inform you about the management of emergencies and talk you through the first aid which you may need to administer at the time of the emergency. This will ensure a better chance of survival for your animal until such time as you can get it to the vet. Many vets have first aid kits available for sale, for pet owners, which can assist you with treatment in the first instance after an emergency has occurred. 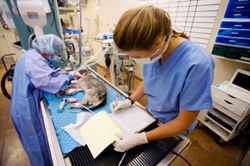 In medical and veterinary circles the first hour after an emergency is referred to as the “golden hour”, which means that if treatment and life support can be provided within one hour of the emergency occurring, the chances of survival of the patient increases exponentially. Some of the more common emergencies seen in domestic animals include burn wounds, bite wounds, major trauma like being hit by a car or getting caught in a garage door or security gate, cuts and abrasions, drowning, bleeding, poisoning, snake bites or bee stings, heat stroke, acute aggressive skin infections, blocked bladders in tomcats cause by bladder stones or crystals, bones perforating the intestines and infection of the uterus in un-sterilised female animals leading to acute septicaemia and death. Where there are external signs or symptoms of the emergency, your action in administering first aid may be the deciding factor in saving the animal’s life. If, for instance, your animal suffered a deep cut, perhaps from jumping through a glass window or getting caught by a sharp object, and a vein or artery has been severed leading to extensive bleeding, the most important thing you can do is to prevent any further blood loss by applying firm pressure to the area where the bleeding is coming from. Should you have a first aid kit available, the ideal thing to use under these circumstances is a cotton wool ball wrapped in gauze. It is always better to use gauze swabs with bleeding rather than applying cotton wool directly to an open wound, because cotton wool tends to leave behind fibres which are difficult to remove once the bleeding has been stopped and the wound properly treated. In an emergency, however, almost any cloth or fabric will do to use to put pressure on a bleeding wound. As long as the bleeding can be stopped or contained until such time as you arrive at the vet, you would have done your bit in saving your animal’s life. In case of heat stroke or burn wounds the best thing you can do is to put the animal in a bath and run cold water over it as soon as you can after the incident. If you can do this for at least a minute or until such time as hyperventilation or fast breathing has stopped, and then get the animal to the vet as soon as you can, you would have provided essential first line treatment. In the case of bee stings, the best thing you can do it to remove the sting of the bee by scraping it off the skin with a sharp knife. Never attempt to pull out the sting with your fingers, as this will merely inject more poison into the animal. Some animals can develop anaphylactic shock or “bee sting allergy” which can be fatal, so it is always a good idea to get your animal to the vet once the sting has been removed, to make sure it is safe. With snake bites there is usually very little you can do, once the animal has been bitten. The most important thing to do is to try and identify the snake, so the vet can make an informed decision when treating your pet. In case of poisoning it is always a good idea to take the container or packaging of the offending poison with when you go to the vet, if you know this was that the animal ate or drank. Where there are no external signs of trauma, the best thing you can do is to get the animal to the vet as soon as you can. Resuscitation procedures like those we see on television in human emergencies, like mouth to mouth breathing and heart massage, can be effectively used in animals to keep a dying animal alive until such time as you can get them to the vet. The way to do mouth to mouth breathing in a dog is to hold its muzzle or mouth with both hands sealing its lips on all sides and putting your mouth over its nose and blowing like you would inflate a balloon. In cats, you simply take the animal’s head in one hand and put its whole face in your mouth, covering its nose and mouth completely, and then blowing. It may not sound like the most hygienic thing to do, but you can wash your mouth out later, once you have saved your animal’s life. Be careful in smaller dogs breeds and cats not to blow too hard. Their lungs are small and if you blow to long and too hard you will burst the “air sacks” or alveoli, which can lead to more damage. To do heart massage in small breed dogs and cats you use one hand by placing the animal’s chest deep into your hand just behind the animal’s front legs with your thumb on one side and other fingers on the other side of the chest and pressing them firmly towards each other. In bigger breeds of dogs you will have to use both hands by putting both hands flat on either side of the animal’s chest, once again just behind the front legs and then pushing your hands towards each other as firmly as you can. The rhythm of maintaining artificial breathing and heart massage is to alternate between two breaths for every five pump actions to the heart. The pump actions to the heart must be done by counting, thousand and one, thousand and two, thousand and three, thousand and four, thousand and five. If the reason why you have to apply artificial breathing and heart massage was near drowning, you need to keep the animal’s head down and try and get as much water and fluids our of the animal’s airway and lungs as possible. Not all emergencies are acute in nature and sometimes an emergency can arise through a disease or condition which has been left untreated, and which develops to the point where if treatment is not provided expeditiously, then it will lead to the animal’s demise. In some of these cases there may still be a chance that emergency treatment may save the animal’s life, but in most cases even the most intensive and elaborate treatment may not be sufficient to save the animal’s life. It is always imperative to be prepared and act swiftly in case of any emergency and seek veterinary treatment as soon as possible rather than waiting too long, and expecting the vet to perform miracles. More importantly though, remember, prevention is better than cure, so be vigilant to prevent emergencies in the first instance rather than dealing with the consequence after the emergency has occurred.